I know. The last two articles I’ve written have bordered on human resource heresy. The suggestion that unstructured interviews should be abandoned and resumes are useless goes against everything school administrators (and many human resource professionals) are comfortable with. Stick with me through the remainder of this post and maybe you will see my point. What is the point of the teacher selection process? To hire effective teachers, right? What does a resume really tell you about how effective teachers will actually be in the classroom? Resumes tell you nothing beyond what could be collected on a web form or standardized document (that is far easier to glean information from in mass). Resumes serve as a marketing tool for applicants. Savvy job seekers utilize eye catching print advertising techniques to make their resume stand out from other applicants. From a selection standpoint it does nothing more than add bias to the teacher hiring process and distracts decision makers from honing in on applicants who may have the greatest potential to be an effective teacher. I had a discussion about resumes with a close friend of mine who works for a local technical school. His job is to help graduates from the various technical programs with the school secure employment prior to graduation. I asked him how important he thought resumes were and how he helps graduates find jobs. He said creating eye catching resumes was the most effective way that he has found to help graduates secure a job. He first showed me the high quality linen paper he uses for all his graduates. Next he showed me the top three resume formats he uses. My friend opened up a separate document that provided eye catching ability statements with “vivid verbs” to further illuminate the skills the applicant purported to have. He said the most effective thing that he does for soon to be job seekers is to add colorful logos that represent the various certifications obtain upon graduation. My friend replied, “I am evaluated on how quickly I am able to help graduates secure employment. Whatever I can do to help them stand out and get hired, that’s what I am going to do. If an employer later finds out that the person wasn’t a good fit, or didn’t have the specific skills they were looking for . . . well that’s their problem isn’t it?” I had to agree. My friend’s comment gets to the heart of my argument. Resumes are a waste of time for administrators and school districts. 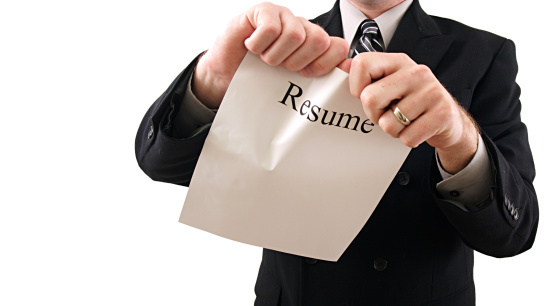 Resumes are a marketing tool that serves the applicants’ needs, not the employer. Don’t believe me, there are websites that actually describe resumes as a marketing tool. Resumes are typically unstandardized. Therefore, they are submitted in a variety of formats making them very difficult to compare one candidate’s potential vs. another’s objectively (which should be one important goal of any selection process). Resumes tell school districts very little about the applicant teacher’s abilities and are more likely to introduce bias into the selection process rather than helping employing school districts identify potential teachers who would be a good fit and have the job related skills they are seeking. Another problem with resumes is how they are used to make inferences about applicant characteristics. I have spoken with many HR professionals and principals that told me, “If I find one spelling or grammatical error, that resume is out!” While omitting resumes with a few errors may be an easy way to weed through the stack of applicants, school districts should not draw conclusions about the content of the resume that the resume is not intended to measure. If a district wants to measure intelligence, communication skills, and contentiousness, they should use validated tools that are actually designed to measure those characteristics in applicants. When I reflect back to the administrators and teachers that I’ve worked with over the years, some of the most intelligent and effective leaders were terrible spellers and made numerous grammatical errors through our email correspondence. Using the filters that many districts use to sort through resumes, they would have never been given a chance to move forward in the selection process. In conclusion, if school districts are using resumes they should use them for the purpose they are actually intended, to collect job related data about applicants. Districts should not attempt to make inferences that resumes are not designed to measure. At this point readers may be thinking, “Okay, I see the flaws in relying on resumes to hire teachers, but what alternatives are there?” If school districts will maintain focus on two guiding principles in selection they will do well. 1. The teacher selection process should cast a wide net to identify effective teachers and should have tools to identify which teacher applicants have the most potential to be effective and a good fit within the district. 2. The tools and methods used in the selection process should have validity and reliability. This simply means the selection methods in any school district should be based on job related competencies and should have the potential to be applied in a consistent and standardized manner. So how are these two principles applied if resumes are used to hire teachers? If a district is dead set on using resumes, the most reliable way is to use a rubric to evaluate resumes. The use of a rubric focuses the judgment of raters on specific criteria that should have been validated to lead to the selection of effective teachers. This may seem like a lot of work, but when teachers evaluate subjective data, like essays or projects, they are expected to use rating tools, such as rubrics. Why wouldn’t school districts hold the same expectations for something as important as the hiring of the professional teachers who will lead students in the classroom? So if resumes are fraught with bias and have the high potential to be used in invalid and unreliable ways, what is the alternative? Professional portfolios. One industry has all but abandoned the resume, the tech industry. Software firms are not interested influenced by the aesthetics or appearance of the resume. They want proof beyond bullet point statements that programmers can perform the skills that are needed on the job and a resume does not allow for demonstration of skills. As a result, many IT companies now require applicants to submit a portfolio of their work that demonstrates the applicants’ position related abilities. In the creative professions, portfolios are a far superior method to demonstrate actual abilities than resumes. Here is what one programmer wrote online regarding the use of resumes in the software development world. I don’t need a resume to tell me whether a designer is great – I have their portfolio. I don’t need a resume to evaluate a programmer – I can view their code. I don’t need a resume to evaluate a sales person – the persuasiveness of their email, the way they talk on the phone, and their willingness to follow up tell me what I need to know. The thing that of course matters in opportunities is real experience. Not the artificial kind that you pad a resume with mind you but real projects that people can see and evaluate. Instead of being concerned with who gave you your diploma, some intrepidly modern companies only want to see samples of work that you’ve done.” The programmer went on to say, “I have to admit, this does seem a fairer and possibly more accurate measure of someone’s efficacy. By judging candidates’ work before all else, the playing field is suddenly leveled in an intriguing way. Who says the art student in community college isn’t a better web designer than the ivy-league graduate? A quick look at their portfolios would tell me a lot more than a Word Document with bullet points rambling on about their respective career goals. Prior to the 21st century it was difficult for applicant teachers to showcase their potential as a future employee without actually teaching a lesson to a live audience of evaluators or dropping off a VHS. When applicants wanted to show off the creative and engaging lessons they had designed they had to bring several manila folders full of sample lessons to present. Not so in the world of education today. New and experienced teachers alike have the ability to digitally record themselves providing instruction to students and send those files via email or web forms. Applicant teachers can electronically share examples of websites they have created or manage, project based learning, and many other examples of how they are qualified to excel in the position they are applying for. A portfolio can tell an employer far more about a candidate’s abilities than bullet points and linen paper ever will. If you are a teacher who is reading this, test this out and see if I’m right. Register for a free website on wordpress, blogger, google sites, or any other free website. Begin uploading videos of yourself teaching in the classroom, sample lessons, student work (with names omitted of course), and links to websites that you have designed or sites that you manage (like schoolology). When you finish uploading content to your site create a QR code from your site. Finally, when you submit your application, attach a cover letter that details your desire to work for the district, your qualifications and finally insert a link to your site as well as the QR code at the top and bottom of your cover letter and explain that you have prepared a site that demonstrates your ability to excel as a teacher in the district. If administrators are searching for teachers who can excel in the 21st century classroom, applying for a teaching job in the manner just described will tell an administrator more about your abilities than a resume ever will. Hopefully in this post I have at least been able to create some room to consider an alternative to resumes in the efforts to hire effective teachers. Adapting and changing comfortable ways of doing things is difficult; just ask any teacher who has been in the classroom more than five years. However, as is the case in the classroom, change can bring about tremendous progress and lead to more effective ways of meeting the needs of students through even better instruction. The first step in shifting from resumes to professional portfolios is a paradigm shift from doing things because they are familiar to using more modern and valid methods that allow applicants to showcase their actual abilities. If your district would like to further discuss how to begin using professional portfolios or use resumes in a more effective manner in the selection process, feel free to contact us. The goal of k12hrsolutions is to help districts become more effective through their human resource practices. I will do whatever I can to assist your district in achieving the most important goal of all, improving the learning experience for students. If you found the discussion here interesting consider subscribing to the blog here at k12hrsolutions. Also please consider helping us grow our audience. You can help by sharing this discussion, or any other discussion on your favorite social media sites.